Global consultancy Prophet unveiled the second edition of its Brand Relevance Index (BRI), a ranking of the most relevant brands in consumers’ lives today. Apple maintained its standing as the most relevant brand, while Amazon jumped ahead to take second place. The BRI measures brands against the four dimensions Prophet uses to define relevance: customer obsession, ruthless pragmatism, pervasive innovation, and distinctive inspiration. Using these four dimensions, Prophet conducted a survey of 15,000 U.S. consumers about more than 300 brands across 27 industries. Apple, one of the largest and most profitable companies in the world, retained its top spot in the ranking, earning the highest score in three of the four dimensions of brand relevance. Amazon, which ascended into second place, ranked the highest in the remaining pillar, pragmatism. It also received the highest score in the entire survey for being “available when and where I need it.” However, low marks for emotionally connecting with and inspiring consumers stopped it from unseating Apple as number one. After not making it into the top 50 in the previous BRI, Google made the biggest improvement of any top ten brand, coming in at number five. Making significant gains on trust, an area that previously hindered its ranking, Google also increased its score for pragmatism. 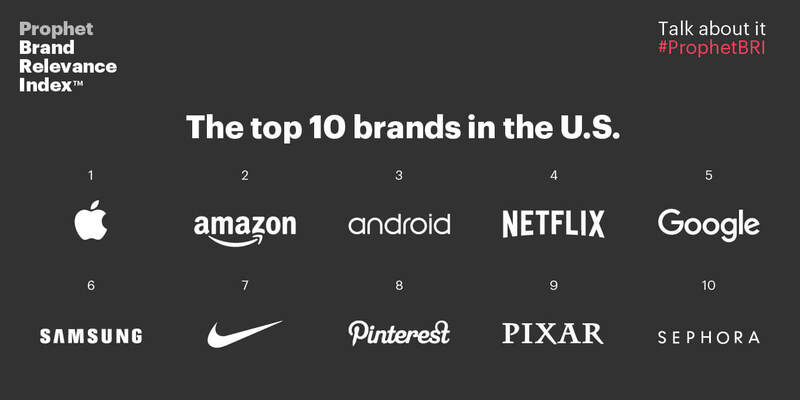 Notably, Google owns the third most relevant brand, Android, which means it is represented twice in the top five. The BRI’s four dimensions of brand relevance are made up of 16 attributes, which measure important brand characteristics like “meets an important need in my life” or “makes my life easier.” The data shows that customer experience is critical to achieving relevance. All of the brands in the top 50 have “delivers a consistent experience” as one of their top five attributes. “We’ve long known how critical customer experience is to a brand, but this data makes it irrefutable. Companies must think about their brand and customer experience as being inextricably linked,” said Davis. “The data from the BRI is so valuable because it allows us to pinpoint the exact elements of a brand that are most important to consumers. By understanding consumers’ attitudes at such a granular level, we’re able to provide business and brand leaders the actionable insights needed to grow their businesses,” added Purewal. To millennials, Amazon is the most relevant brand. Overall, Amazon ranked second, but when looking only at millennial consumers, it came in first. This audience has fully embraced one-click shopping, using Prime to purchase everything from electronics to shampoo. But it’s more than a utility brand, millennials are also turning to Amazon for entertainment as its streaming library expands. Pinterest is the most relevant social media platform. Jumping from #53 to #8, Pinterest is the highest ranking social media brand in the Index. In general, social platforms that feature predominantly visual content like Pinterest, YouTube and Instagram outranked traditional leaders Facebook and Twitter, both of which didn’t even crack the top 100. FitBit made the largest leap of any brand in the BRI, moving up more than 200 spots to #29. The brand scored incredibly well on trust, dependability and for having a purpose consumers believe in. As awareness and adoption of FitBit grows, it is quickly becoming one of the most relevant brand in consumers’ lives. Relevant brands are disrupting traditional category leaders. Prophet analyzed 27 U.S. industries and ranked the five most relevant brands in each. In many cases, the biggest player in a category is not the most relevant. Brands like Southwest and PayPal outranked their competitors because they have disrupted their industries by innovating new business models, experiences, and products. This is the second Brand Relevance Index from Prophet. Due to global demand, Prophet expanded the Index into four markets – United States, United Kingdom, Germany and China. Interestingly, Apple and Amazon rank in the top three most relevant brands in the U.K., Germany and United States. In China, financial services company Alipay ranks as the most relevant brand. Prophet surveyed 45,000 consumers across the U.S., U.K., Germany and China. It partnered with SSI, the premier global provider of data solution and technology for consumer and business-to-business survey research, to program, field, collect and tabulate data. For the U.S. Brand Relevance Index, Prophet surveyed 15,000 consumers about more than 300 brands across 27 industries. Companies from all industries that contribute materially to U.S. household spend were included, except brands in the tobacco and firearms categories or those engaged in primarily business-to-business categories. They were sourced from the Bureau of Labor Statistics’ February 2015 Report on Consumer Expenditures (U.S.). Each participating consumer rated up to five brands within a single category on 16 different attributes that corresponded to the four dimensions of relevance Prophet identified. To rate a brand, a consumer had to be familiar with the brand and a frequent consumer in the brand’s category. More information about the methodology can be found here. Complete Brand Relevance Index results from the United States, United Kingdom, Germany and China can be found at www.prophet.com/relevantbrands-2016. Prophet is presenting the results of the BRI at the Fast Company Innovation Festival in New York City on Wednesday, November 2, 2016, at 10:00 am EDT. 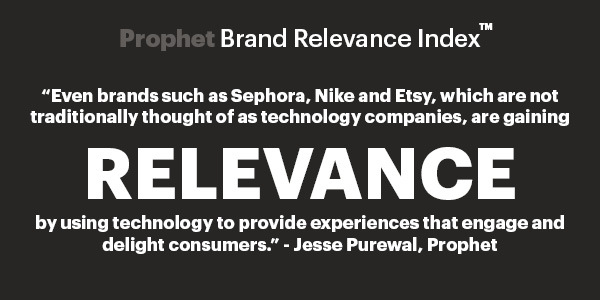 Prophet will lead a collaborative, hands-on workshop to reveal how brands can find and maintain relevance in the marketplace. To learn how Prophet can help your brand become more relevant to consumers, contact BRI@prophet.com.